More and more we have found that families are wanting to volunteer together. It’s not always easy to find opportunities that are suitable for groups, particularly groups consisting of a wide range of ages. 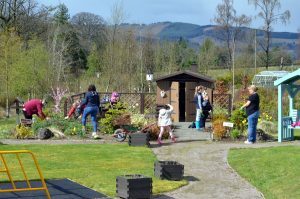 We have introduced an event at Robin House Hospice in Balloch called ‘Bring a Bulb’ where families are invited to come along and participate in gardening. The gardens at Robin House are really big and a large team of volunteers are responsible for maintaining and developing the space. Bring a Bulb enables families to try out volunteering, together, in the gardens. It’s always a great event and whilst some people choose to just volunteer for a few hours on the day, others apply to volunteer more regularly. It’s been a great way for us to engage families and we’re now thinking about how we can develop this idea, offering more opportunities to families. We have recently removed the minimum age requirement for volunteering within CHAS. Of course due to risk some roles require volunteers to be aged 15/16. However we are now able to offer opportunities to children in some of our sites. Robust guidance was introduced so that staff feel comfortable working with children as volunteers – common fears were around PVG checks, ratio of adults to children, and health and safety. We have overcome these challenges and have provided solutions so that we can involve people of all ages, whilst keeping people safe at all times. More and more we are receiving enquiries from under 16s wanting to volunteer. We love harnessing this enthusiasm – after all we are a children’s charity and as a national charity we feel we have a responsibility to promote youth volunteering and drive participation rates amongst children and young people. We reward our young volunteers with Saltire Awards and Young Scot Rewards. Effective volunteer involvement relies on buy-in from the entire organisation, from the top down. At CHAS we have developed four bite-sized volunteer management courses covering all aspects of volunteer engagement. These are essential for staff managing volunteers day to day. One of the courses is open to all staff, irrespective of role, and it is about the value of volunteering and the changing face of volunteering in the UK. This context is essential for them to understand modern volunteering and develop meaningful, flexible opportunities that fit with the needs of modern volunteers. We have introduced a statement in to all staff job descriptions that indicates expectations around working effectively with volunteers. Whether you are managing volunteers or working alongside volunteers, there is a statement on their job description that indicates what is expected of you with regard to working with volunteers. We are about to launch volunteering Key Performance Indicators with staff which we are hoping will also help make volunteering everyone’s business, as opposed to the sole responsibility of the Volunteering department. More and more we are receiving enquiries from people seeking short-term, episodic volunteer roles. We are assigning projects to volunteers that are time-bound. Sometimes those volunteers will move on to another project when finished; others will move on from CHAS, in to employment. 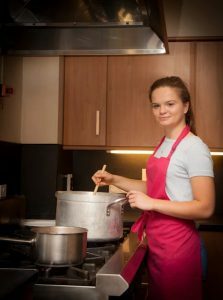 These volunteers are usually graduates with specific skills to offer and they are usually looking to build practical experience. Examples include volunteers with HR degrees taking on HR projects, volunteers with app development experience developing an app for children and families in the hospices, and volunteers with evaluation expertise leading evaluation projects. This is a win win for both the volunteers and for CHAS. We are expecting to see fewer volunteers signing up to volunteer for years. In line with national trends volunteers are approaching us with specific requests to volunteer for short periods of time. These volunteers are contributing so much to the charity and are also challenging staff thinking about what volunteers can and can’t do. In order to secure buy-in from senior staff, we invited Rob Jackson, Consultant in all things volunteering to deliver his ‘From the Top Down’ workshop to our senior management team and middle managers. We are fortunate to have Chief Executive buy-in to volunteering and senior staff are all starting to involve volunteers in their own work. This has helped to model volunteer involvement from the top down and inspire others to involve volunteers in their work. Ensuring members of the Volunteering Department are on interview panels, highlighting volunteer successes internally via the intranet and all staff emails, together with extensive social media promotion of volunteering has helped to promote the value of volunteering at all levels of the organisation. Last year we introduced an equalities monitoring framework for volunteering. The framework and monitoring form were developed by a volunteer with expertise in equalities. We have done retrospective checks and for the first time, have a clear picture of our volunteer demographics. We are now doing targeted recruitment and working to redress imbalances so that our volunteer base is truly reflective of Scotland’s communities.